Guess what I purchased. Yup, Jet Black Wax by Turtle wax . I have heard others mention the quality and the overall greatness of this black wax. For those that do not know, this wax is suppose to help bring your original black to a high gloss black. So original you might be abe to fool your friends that you bought a brand new bike. Okay,maybe not but darn close to the original black. Wash your motorcycle to get all the dirt and grim off. Skip this step only if you plan on detailing the bike with sand paper as your final application. Don’t be lazy, wash your bike first! Oh, use the appropriate soap too. Dish soap will remove everything (meaning your clear coat too) so don’t use that either. Grab the wax cleaner from the kit and the first applicator pad (provided in the kit or use your own) and ONLY use this one for the wax cleaner part of the process. Now open the wax cleaner bottle. Apply wax cleaner on any black surface you wamt to detail. Use a back and forth motion when applying. It’s recommended to work in sections. But come one. It’s a bike. Not much surface. I did the whole thing in one shot. Wait for the wax cleaner to dry. If you did the whole bike at once, the wax cleaner should be dry at the first part you started. Grab the quick detailer spray from the kit and a microfiber cloth. Use a single microfiber towel for this step. Spray and wipe in a back and forth motion till you removed all the wax cleaner. Grab the black wax from the kit and the second applicator pad. Use one pad for this whole step and don’t use the one we used to apply the wax cleaner. Now open the black wax bottle. 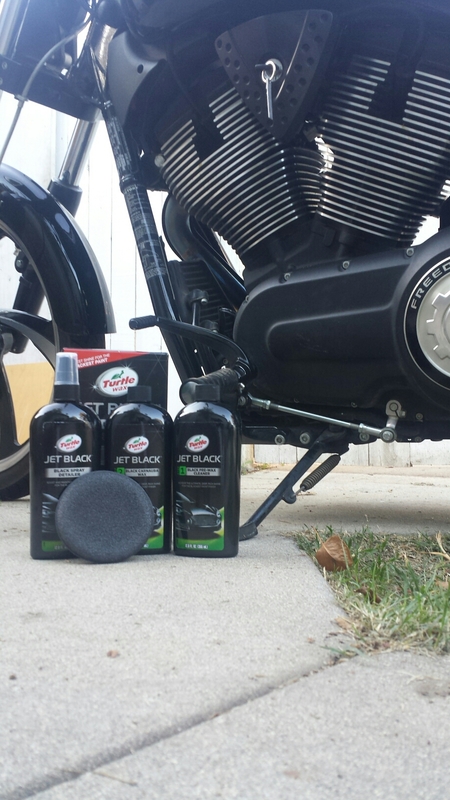 Apply black wax on all black surfaces you previously waxed. Use a back and forth motion when applying. Again, I did the whole thing in one shot and not in sections like the box recommended. Grab the quick detailer spray from the kit and a microfiber cloth. Use a different microfiber towel (that was not used to remove the wax cleaner) for this step. Spray and wipe in a back and forth motion till you removed all the black wax. You are DONE!!!!! Well maybe. See below if you want a deeper shine. This is an optional step. This step will finish off your bike and give it a slight increase in shine. Last step. Grab the quick detailer and a third microfiber cloth. Spray and wipe. Now you just finished giving your bike the extra shine it deserves. Click to find out where we're headed next!